Hargreaves Services believes its £11.85m acquisition of a contractor involved in the Aberdeen Bypass will create “new and exciting” opportunities for one of Europe’s biggest heavy plant fleets. 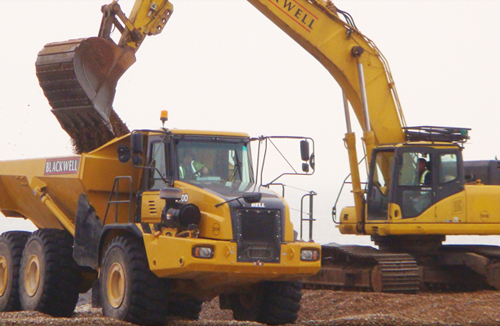 The opencast coal firm this week confirmed it had bought CA Blackwell, the Essex-based bulk earthmoving and plant business which also has the contract for loading and hauling services at Aggregate Industries’ Glensanda ‘superquarry’ near Oban. Hargreaves said Blackwell’s operations will be “highly complementary” to its own business in terms of skills, experience and equipment. Blackwell is expected to show an operating profit of £3.3m on revenues of £89m for the year to December 31, 2015. Hargreaves’ CEO Gordon Banham said: “The acquisition of Blackwell extends the reach of Hargreaves into the UK earthworks and civil engineering sector, bringing further diversification to the group and offering an attractive return on capital. Blackwell, which has a stake in the consortium building the £745m Aberdeen Western Peripheral Route and which last month announced it had appointed Alan McKillop regional manager for Scotland, has been involved in bulk earthmoving and civil engineering for more than half a century. Hargreaves acquired a number of surface mining and related assets in Scotland in 2013 following the liquidation of the two previous operators, Aardvark (TMC) and Scottish Coal. Mining operations contributed £20m of operating profit in the year to May 2015, an increase of £3.5m on the prior year. That increase reflected the first year of operations, at full run rate, of its Scottish assets but the business has been affected by falling coal prices.